Why Is Washington Supporting Fundamentalist Jihadis in Syria? A CIA-backed rebel group has joined with Al Qaeda in attacking another rebel force—the one leading negotiations in Geneva. The peace negotiations between the Syrian government of Bashar al-Assad and the insurgents seeking to topple him and his one-party Baath state were headed on the rebel side by Mohammad Alloush, leader of the Saudi-backed Army of Islam (Jaysh al-Islam, or JI). Russia and the Syrian government objected to Alloush’s group being in Geneva, viewing them as Salafi jihadis, i.e. as Al Qaeda Lite, and as more terrorists than insurgents. The United States and its allies, especially Saudi Arabia, prevailed in insisting that Alloush not only remain invited but head the rebel delegation. The Army of Islam has during the past month been fighting fiercely—but not against Assad’s Syrian Arab Army. Rather, in the eastern suburb of Damascus, East Ghouta, Alloush’s forces have been ranged against another rebel group, a former friend now allied with Syria’s Al Qaeda (the Nusra Front). The fighting has left some 300 dead. Neither side in the Ghouta mini-war wants democracy or equal rights for all citizens. Why is the Obama administration going along with Saudi Arabia’s legitimation of JI? What’s left of the previous Free Syrian Army in the region is an alphabet soup of fundamentalists, some more moderate Muslim Brotherhood elements, others armed with a blueprint for a puritanical Salafi regime in which there is no room for secularists or religious minorities, or for democracy. Some 35 to 40 percent of Syrians belong to ethnic or religious minorities, and the remaining Sunni majority is split between avowed secularists and the religious. Saudi-style Wahhabi Islam, which Riyadh appears to dream of imposing on Damascus, would definitely not work there. Meanwhile, the leftist Kurds of the northeast, who have been one of the most vigorous fighting forces against ISIS, and among whom US special forces troops have embedded, have so far been excluded from the Geneva negotations, at Turkey’s insistence. The Army of Islam has had an alliance with the Freemen of the Levant (Ahrar al-Sham), a Salafi jihadi group powerful in the north of the country. The Freemen of Syria in turn have an alliance with Al Qaeda. Many former FSA units have defected to Al Qaeda or ISIS. The United States has been adamant in continuing to support the remnants of the FSA, even though many have either renounced democracy or pledged vengeance on Syria’s Shiites and other minorities, or insisted they will impose a fundamentalist vision of Islamic law on the entire populationa. The CIA claims to have “vetted” more than 30 such insurgent groups as having no ties to Al Qaeda. And then it passed to these fighters, through Saudi Arabia, TOW anti-tank munitions, making them formidable against Syrian armor. The problem is that the “vetted” groups keep showing up on the battlefield as de facto allies of Al Qaeda in Syria. One of the vetted groups that has at least sometimes used TOWs is the Rahman Corps, which has a strong position in East Ghouta. Last year, the Rahman Corps shared an operation room with the Army of Islam. Now there is a problem. In the past month the Rahman Corps has flipped, joined with Al Qaeda, and begun attacking Alloush’s group, the Army of Islam. That’s right: The leader of the negotiating team at Geneva on behalf of the rebels is now besieged by one of his own US-backed constituents, which is likely using CIA-provided weapons against him. And it is doing so in a battlefield alliance with Al Qaeda. In the East Ghouta pocket, Nusra ally the Rahman Corps and the Fustat Army Operations Room (led by Al Qaeda) have been ranged against the Army of Islam. Fighting between the fundamentalists intensified Saturday night, but it has been raging for twenty days and has killed 300. Most of the dead were members of the Army of Islam and Al Qaeda, though dozens were from the Rahman Corps. The preachers of Al Qaeda, or the Nusra Front, were said to be inciting the killing of members of the Army of Islam. The Rahman Corps began the struggle in late April, when it attacked the Army of Islam positions in the middle districts of Ghouta, took 400 of their rivals captive, and disarmed them. One Syria freelance journalist alleged that the attack on the Army of Islam was coordinated between the Rahman Corps and Al Qaeda. 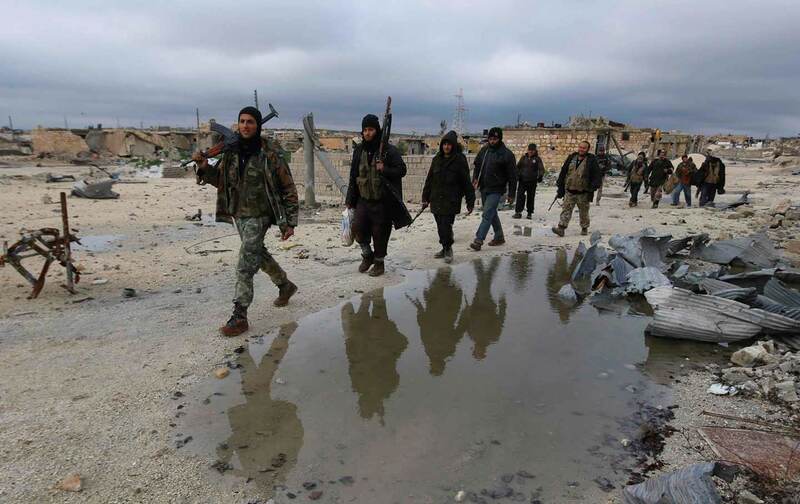 On Thursday, the Nusra Front, along with its ally, the Freemen of Syria (Ahrar al-Sham), also attacked in another part of Syria, the Alawite Shiite village of Zara, south of Hama. There, they stand accused of butchering at least 19 civilians and of desecrating the bodies of the dead Alawites, who mostly support the government of Assad (himself an Alawite). The villagers maintain that the invading insurgents slit the throats of their victims in their homes, and that those killed included children, women, and the aged. The Freemen of Syria denied targeting civilians. The Alawites comprise some 10 to 14 percent of Syria’s population. Remember that the Army of Islam of Mohammad Alloush, the lead negotiator in Geneva, is allied with the Freemen of Syria and that Alloush’s family has been vitriolic against Syrian Shiites. The Assad regime is guilty of crimes against humanity, and many of the groups that took up arms against it were fired by a desire for a more just society. But many of the supposed friends of the United States in Syria’s opposition have an unsavory ideology, unsavory friends, or are themselves guilty of war crimes. Washington has to stop arming these groups if there is ever to be peace in Syria, and it needs to pressure Saudi Arabia to cease trying to push Syria to the far right. The weaponry sent in by Saudi Arabia on Washington’s behalf in any case often makes its way to Al Qaeda or ISIS. The Army of Islam shouldn’t be the lead negotiator in Geneva! The leftist Kurds need to be brought into the negotiations if the northeast is to remain part of Syria, and their voice on the opposition side is important to offset the powerful megaphone of the minority Salafis.